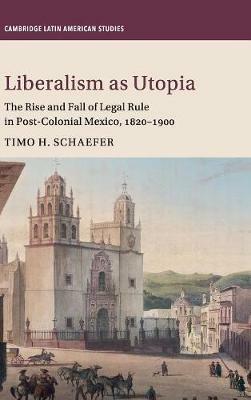 Liberalism as Utopia challenges widespread perceptions about the weakness of Mexico's nineteenth-century state. Schaefer argues that after the War of Independence non-elite Mexicans - peasants, day laborers, artisans, local merchants - pioneered an egalitarian form of legal rule by serving in the town governments and civic militias that became the local faces of the state's coercive authority. These institutions were effective because they embodied patriarchal norms of labor and care for the family that were premised on the legal equality of male, adult citizens. The book also examines the emergence of new, illiberal norms that challenged and at the end of the century, during the dictatorship of Porfirio Díaz, overwhelmed the egalitarianism of the early-republican period. By comparing the legal cultures of agricultural estates, mestizo towns and indigenous towns, Liberalism as Utopia also proposes a new way of understanding the social foundations of liberal and authoritarian pathways to state formation in the nineteenth-century world.